Keeps kids' toys tidy and looks fabulous! 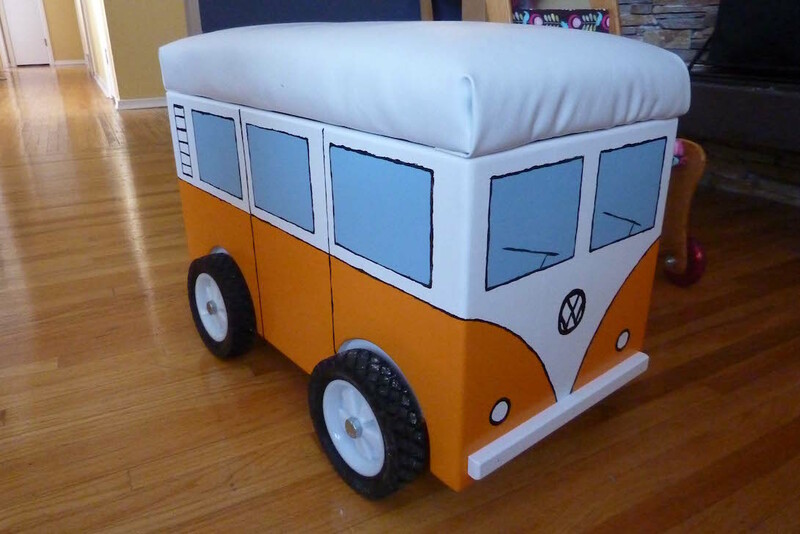 This Volkswagen camper van storage bin for kids can’t be bought in stores. But you can make it! With a soft, pillow-like top, the storage box doubles as an ottoman or small seat. And the wheels on the bottom provide more than just looks. No more lifting a hard-to-grasp storage bin, just use the wheels to move things along to wherever you want. While the die hard VW fans will notice many historical inaccuracies (not enough windows for the paint design, but too many for the pop top, etc.) you can’t deny that this is pretty darn cool. Medium-density fibreboard (MDF) make up the walls, and 6″ lawnmower wheels provide mobility. Learn more about it at craftcollective.